A long distance trek is one of my favourite vacations. This ‘active relaxation’ holiday is rejuvenating. Not to mention addictive. I now do at least one every year now. These are 7 common things that will wreck your trek, along with how to prevent them from happening to you. 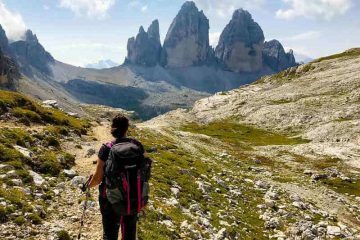 Avoid these seven things that can wreak havoc on your long distance trek, and you’re sure to have an epic trip of a lifetime! While I’ve LOVED my long distance treks – Tour du Mont Blanc, Everest Base Camp, Wicklow Way, West Highland Way, the Dolomites, the Italian Riviera and, most recently, the Dana to Petra trek in Jordan, I’ve also had rough spots on some of them. Along the way, I’ve also met a lot of hikers who were miserable. Enough so that they quit. Instead of feeling bliss and a sense of accomplishment, they walked away in misery. It doesn’t have to be that way though. Nothing will wreck your trip faster than blisters where each step is agonizing, and no amount of mountain peaks can stop you from focusing on the pain you feel. Fortunately, to a large extent, they are avoidable. Break in your hiking boots. Hiking in new hiking boots that you haven’t worn is almost asking for blisters, so while it’s fine to buy new hiking boots for your TMB adventure, break them in first. Also be sure to buy them in the afternoon or evening when your feet are swollen, as they will be when you’re hiking. Years ago, I made the mistake of buying my hiking boots in the morning and even though I bought a 1/2 size bigger to allow for swelling it wasn’t enough. I ended up with blisters on every single hike I did until I eventually gave up and bought new ones. Keep your hiking boots dry with a waterproof spray. If your boots get wet, you’ll create friction which means blisters. It’s very likely that at some point while hiking the TMB you’ll be walking in the rain so bring a waterproof spray with you to keep the moisture out of your boots. If it’s raining hard, gaiters can also help keep your boots dry. Invest in a good pair of socks with wicking material to keep the moisture away from your feet. Now is not the time to stock up on bargain cotton socks. Wearing cotton socks is practically asking for blisters. Bring Compeed. If a blister does develop, I’ve found this is the best solution to prevent further rubbing. You’ll find more ideas on how to prevent blisters and tips on how to treat a blister here. If you wake up and feel like an old granny or grandpa who takes 5 minutes to lift yourself out of bed, it’s going to be rather difficult to motivate yourself for a 6-hour hike day after day. Adequate Training in advance can help ensure that your muscles are ready for the challenge that awaits. I swear by, even though I hate it, a cold burst of water at the end of my shower, focusing on my sore muscles. In my case, it was my shoulders from carrying a heavy pack. If you aim the shower nozzle at the affected spot and hold it there for a minute, it will reduce inflammation. You can read more about cold water treatment in this study. It won’t be possible for you to take a bath while on most long distance treks but a cold shower or bursts of cold water is possible. A far more pleasant experience and the #1 non-essential item I recommend bringing is a massage ball. This feels SOOOO good on aching shoulders, legs, feet wherever. It’s cheap, doesn’t take up much room and provides immediate relief. Take magnesium supplements. Magnesium helps to relax the nerves and muscles. I took supplements every day while hiking and believe they helped. You can read more about them here. While there is no best way to do a long distance trek, there is the best way for you. Carefully consider whether you want to do an easier or more difficult version. In addition, on some treks, you can either choose to carry your own luggage (making it much harder). 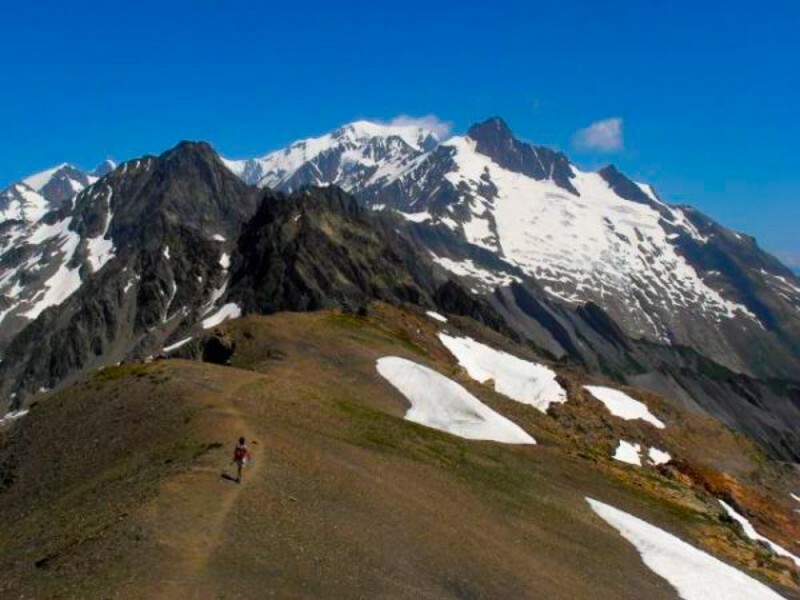 For example, for our Self-Guided Tour du Mont Blanc Treks, we offer 7, 9 or 10-day tours. You should choose the one best aligned with your fitness level. 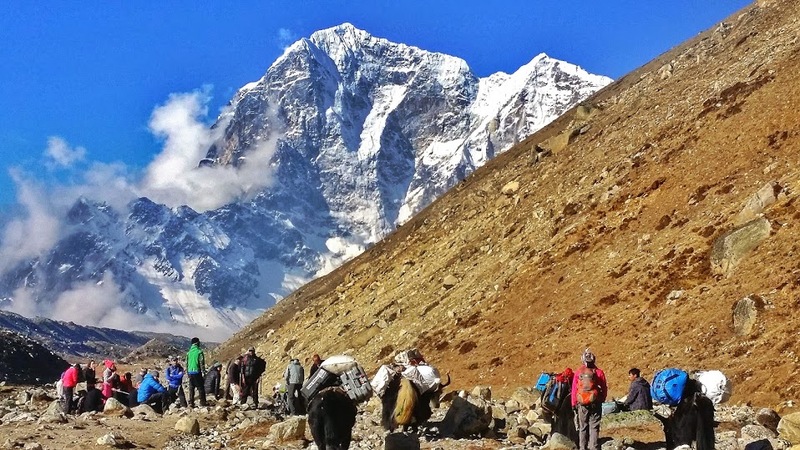 Our 7-day tour is the easiest with ~ 4 – 6 hours of hiking each day, the 10-day tour is the middle option with ~ 6 hours of hiking each day, and the most difficult option is the 9-day option with ~ 6 1/2 hours of walking each day. Keep in mind these times don’t include breaks so expect to add at least 1 – 2 hours to your hiking time. When choosing your tour, be honest with yourself about your fitness level and abilities. You want this to be an incredible experience, not a painful one. There’s a very good chance that you will get rained on at some point while hiking. Mountain weather is known for being unpredictable and for changing in an instant. Fortunately with a little bit of preparation getting wet is very easy to deal with. As mentioned above, ensure that you have a waterproof spray for your hiking boots. You should also bring a waterproof coat and pants – in addition to quick-dry hiking pants. Be sure that your backpack has a waterproof cover and pack your valuables like your mobile phone and passport in a dry bag. If it’s raining hard and you’re carrying your gear, it’s also a good idea to have a larger dry bag that you can fit at least some of your clothes into. That way you’ll be guaranteed to have a change of dry clothes. One thing that surprises many trekkers is how light breakfasts are on some treks. For example when you hike the TMB a typical breakfast at a hut will be tea or coffee and a croissant. This is a cultural thing. Most Europeans eat much lighter breakfasts than we do in Canada and the United States. If you’re lucky, there may be a small cheese and meat plate, yogurt and a piece of fruit. That may not be enough to sustain you so ensure that you bring extra snacks to tide you over until lunch. You can order your lunch at your hut the night before for a fee. A typical lunch on the TMB includes sandwiches and a piece of fruit, but you can ask at the hut before you order. Thankfully, dinners are much heartier and are usually three courses. Meals will vary depending on what trail you are hiking but it’s always a good idea to bring extra trail mix or energy bars. You don’t want to be a hungry hiker! This can be an issue if you’ve chosen dormitory accommodation in a mountain hut. While huts are typically quiet (hikers are tired) it’s almost a given that someone will be snoring. Fortunately, this is remedied by bringing earplugs. They will make a huge difference to how well rested you’ll feel. 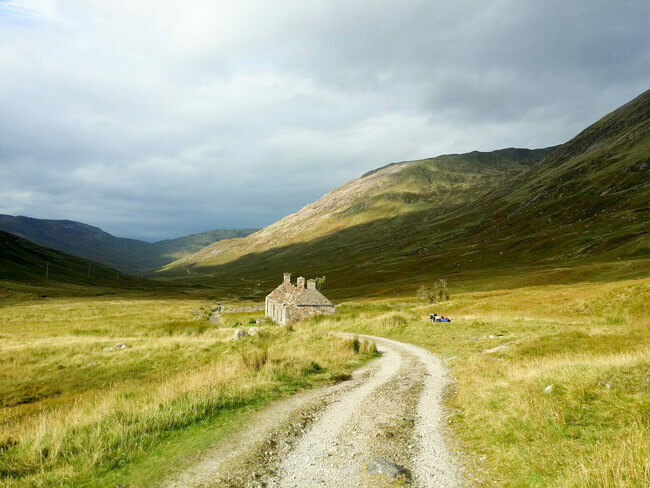 Hiking the West Highland Way in Scotland. Whether you’re hiking with a friend, relative or partner tensions may arise no matter how much you love the person(s) you’re hiking with. It’s easy for both parties to get frustrated if you’re hiking at different speeds or have different ideas of how often to take breaks and for how long. I find the best way to deal with these kinds of differences is to have an adaptable hiking flow. By this, I mean start hiking together but if one person is much faster than the other and both parties are getting annoyed by having to speed up or slow down, agree to walk separately for a time (don’t just take off) and agree on a meeting place on the trail. For example, you can look at your map and see there’s a hut a few kilometers ahead and can agree to meet there and stop for a break. This works best when both parties have mobile phones so that you can send a quick text to each other to check in. Another idea is that if there is a steep section near the beginning of the trail, the slower hiker can get an earlier start and agree to meet the faster hiker at the top. Note, this only works if both parties agree and are OK with hiking small sections alone. My husband and I did this while hiking the TMB and it worked perfectly. Neither of us likes talking much while hiking and we both like walking at our own paces. On the days and sections, it was the same, we hiked together, and on the days it wasn’t we walked short sections separately as outlined above. If you’re not comfortable hiking small sections alone, then ensure that your hiking buddy walks at a similar pace as you do, or that whoever is faster doesn’t mind walking at a slower pace. I find it’s useful to have these discussions ahead of time and agree on a strategy. That way, you’ll avoid surprises and disagreements on the trail and thoroughly enjoy your time with your hiking companion. Laurel Robbins is the founder of Monkeys and Mountains Adventure Travel. She's passionate about getting outdoors as often as possible and helping travellers do the same on their vacation in a sustainable way. She's Canadian and grew up in the Canadian Rockies but now lives in Munich, Germany. You can find her skiing or hiking in the mountains most weekends, hanging out with her cat or with her nose in a good book. Previous postAre You Accidentally Inflicting Animal Cruelty On Your Vacation? You have done some amazing treks, Laurel! Well done! How long do you usually prepare for a trek? @Agness - I don't usually do anything special to prepare since I hike once a week and am active with cycling, running and yoga the rest of the week. So far, that's been enough. It is very beautiful pictures of scenic beauty. Long distance trek should be well planned, so that it will not ruin your excitement and become duty rather than craze to go at top. I am also an nature lover and love to travel on my foot, so. Trek becomes one of my favorite sport. This is wonderful list which everyone should read. I am going to cover some best trek in Indian Himalayan region including world heritage site "Valley of Flowers" next month. Feeling proud to found this great informative post shared by you. It will really help me to make my plan and backpack accordingly. Tons of Thanks again and again for this post. Keep writing!! Great post! This is very helpful in avoiding those common wrecks on trekking. Thanks for this. @Sarah - I was a regular hiker (every weekend) and was very active until about a month before my trip. I'd recommend regular hiking before jumping in as it's tiring doing day after day and you want to be able to enjoy it. © Copyright 2018 Monkeys and Mountains Adventure Travel | All Rights Reserved | This site contains affiliates in which I earn a commission at no extra cost to you.